Together with our suppliers and other stakeholders we constantly seek how to make their catching methods even more selective and more environmental friendly. We explore new equipment and technologies which can reduce by-catch and further improve the selectivity of fishing only wild tuna which have had a full breeding life, without any by-catch. 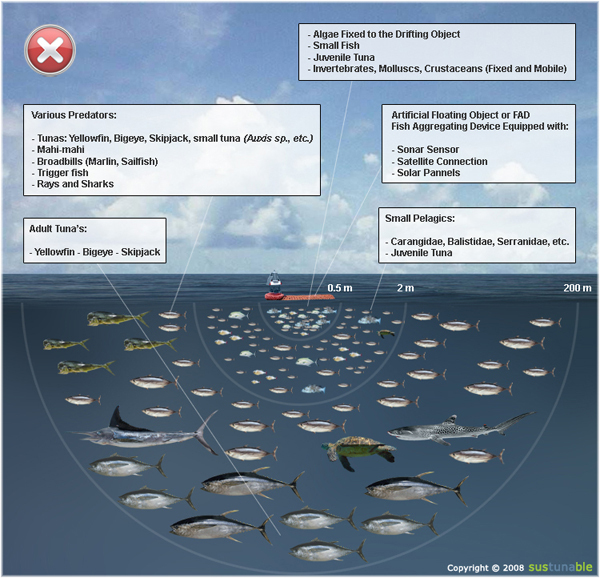 Tuna fisheries can have a high by-catch of non-targeted species, if non-selective methods are used. WWF has estimated that about 4.4 million sharks, 80,000 loggerhead turtles, 10,000 leatherback turtles and 44,000 albatrosses are killed annually in tuna long lining, which harvests about 15 -20% of the world tuna catch. In the purse seine fisheries more than 50% of the catching by using. FADs or Fish Aggregating Devices is done. These man-made floating devices attract entire ocean communities of all kinds of fish, and mostly tuna. This method causes a high level of by-catch which can vary from 5 to 25%. A high percentage of the baby tuna, skipjack, bigeye and yellowfin gets caught along with the larger skipjack. This can have a very negative effect on the reproduction of tuna, and can adversely effect the ocean eco-system. 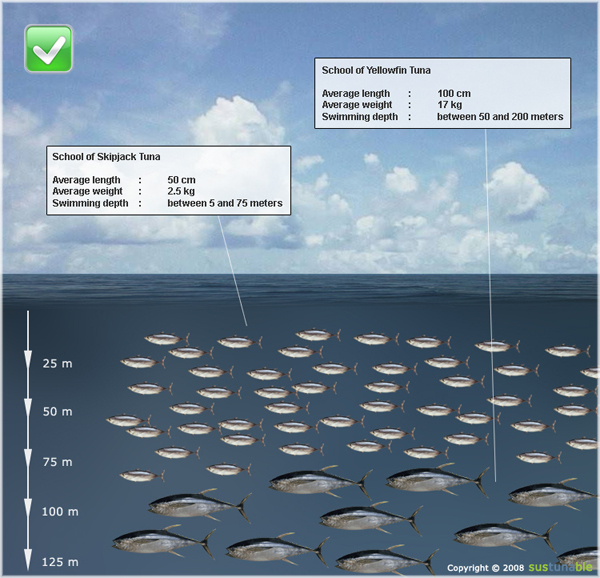 ONLY nets will be set on schools of mature tuna – with the intention to minimize the catch of immature undersized tuna and non –targeted species such as sharks, dolphins and many others ocean species. ONLY tuna from well managed fisheries – where independent observers are on-board – will be supplied. Fortunately the by-catch of dolphins in purse seine fisheries have been hugely reduced over the last 2 decades, by improving catching methods and developing techniques which allow dolphins to escape from the net. Thanks to the effort of environmentalists and fisherman in 2007 less than 900 dolphins were killed or injured in tuna fisheries, and every year these numbers continue to decline. Fortunately dolphins no longer are an endangered species. Currently only 4% of the worlds tuna catch is caught in association with dolphins, while about 90% of the world tuna catch is monitored by dolphin activists and certified with the dolphin safe logo. Sustunable supports the AIDCP (Agreement on the International Dolphin Conservation Program). This program allows setting net of schools of yellowfin which associate with dolphins, under the explicit condition that dolphin friendly catching techniques are used. (Association of dolphins only occurs with yellowfin tuna and only in a small part of the Eastern Pacific Ocean – not anywhere else in the world). Along with WWF, Greenpeace International and the FAO we believe that the eco-system approach of the AIDCP is the best assurance that along with dolphins, also sharks, turtles, billfish and juvenile tuna are best protected. Greenpeace and WWF joint statement on the AIDCP Dolphin Conservation Program. Sustunable only works with certification and eco-labeling programs which fully comply with the Code of Conduct for Responsible Fisheries of the United Nations and also meet in detail with the FAO Guidelines for Eco labeling of seafood products.